“It’s time,” I whisper to my sleeping eight-year-old son. At the sound of my voice, his eyes open a crack, then go wide as he remembers our plan from the night before. Bounding out of his bed as if afraid I might change my mind, he dresses quietly and quickly so as to not waken his sleeping mother (who was unambiguous about her desire to sleep in) and together, as furtive as thieves, we slip out the door and make our escape. The beach at Heidel House Resort & Spa on Green Lake. Emerging from our hotel into the dawn light, we fall down the little grass-carpeted hill to claim our waiting rowboat near the dock, tuck our fishing poles into the bow, and then drag the little craft shooshing across the white sandy beach toward the rim of Wisconsin’s Green Lake. As we put in to the clear water, the submerged rocks in the shallows play soft, hollow drumbeats against the sides of the boat. And then with a little push we’re away, gliding beyond the reach of even the last grasping edges of the land, floating out over the ever-increasing depths, entering into the stillness of Green Lake. 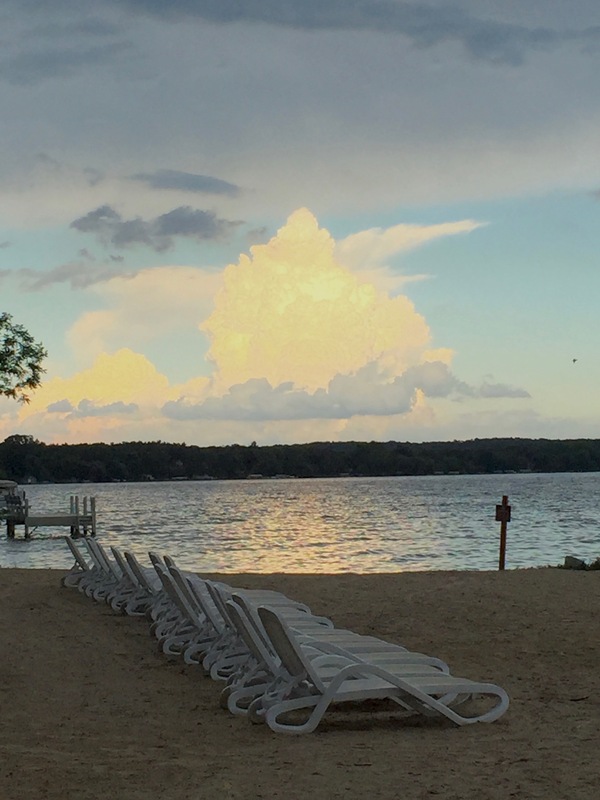 Wisconsin’s Green Lake has been a peaceful playground and quiet retreat for vacationers for well over a century. Each year, they came from Milwaukee, Chicago, Madison, and the smaller middle-western towns in between to luxuriate on the sandy beaches, picnic on the grassy shores, and take respite from the summer’s heat in the welcoming cool waters of the lake. That tradition continues today. The Heidel House Resort & Spa is our comfortable home base for the weekend. Heidel House lies on a 20-acre forested sprawl of shore land along the upper east end of Green Lake, directly across the road from Tuscumbia Country Club’s golf course, the oldest in Wisconsin and one of four in the area. For more than 60 years, there has been a Heidel House on this spot, but the area has been a vacation destination far longer. Walking the halls of Heidel House you can see framed 19th-century photographs of Victorian-era women in their elaborate swimming costumes wading waist-deep along the shore, the men in unitards with straw boaters perched on their slicked-back hair. Originally the private summer residence of newspaper publisher Herb Heidel and his wife Lucille, the property eventually passed to their heirs who opened the doors to visitors as a vacation retreat, gradually adding on to the structure over the years. In the early 90’s, the main lodge was reconstructed and enlarged to accommodate the growing numbers of visitors. When the neighboring mansion to the west became available in 1975, it, too, was absorbed into the Heidel House grounds and now serves as the area’s premier dining destination, Grey Rock. In 2006, the resort created Evensong Spa to further burnish their credentials as a consummate luxury destination, and it regularly occupies the lofty upper reaches of lists for best spas in the country. There is also both an indoor and an outdoor swimming pool, a gift shop providing all the little necessaries you might have forgotten to pack, the aforementioned sandy beach, a string of boat docks, and a comfortable lobby lounge. In other words, everything you might need for an inspired weekend getaway. 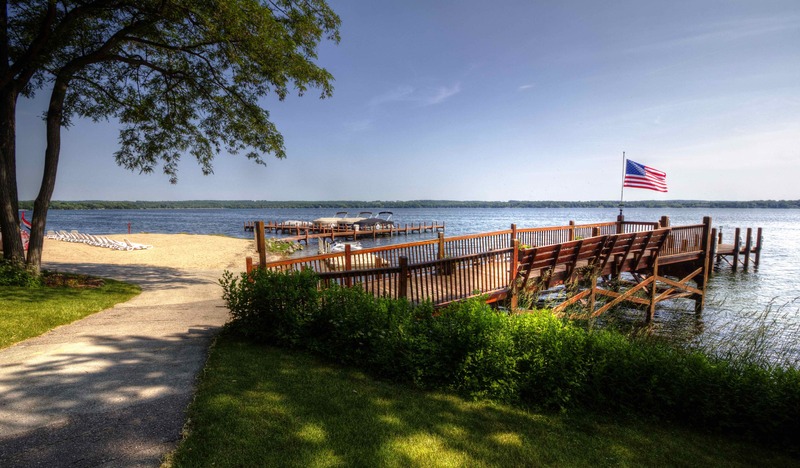 At a maximum depth of 327 feet, Green Lake (sometimes called “Big Green Lake” so as to avoid confusion with the nearby Little Green Lake) is the deepest natural inland lake in the state of Wisconsin, more than 11 square miles wide, and with nearly 30 miles of shoreline. Fishing is easy, if you’re so inclined. Anglers have landed record-setting trout and cisco here, and the lake is also home to northern pike, white bass, walleye, crappie, bluegill, catfish, and a healthy population of good-sized muskies. My son and I have consistently good luck fishing right off the dock, bringing in pan-sized rock bass and walleye at all times of day. The water is extremely clear, and we could often see large schools of fish — including a few genuine lunkers — hanging out as if they were just waiting for us to cast our lines. More motivated fishing enthusiasts can rent a boat from nearby Action Marina who will drop off a boat for your use at a pre-arranged hour and pick it up when you’re done. Heidel House is happy to provide complementary fishing poles and gear, and you can pick up any bait as well as any other fishing supplies and equipment a short drive away in Green Lake’s charming downtown area. 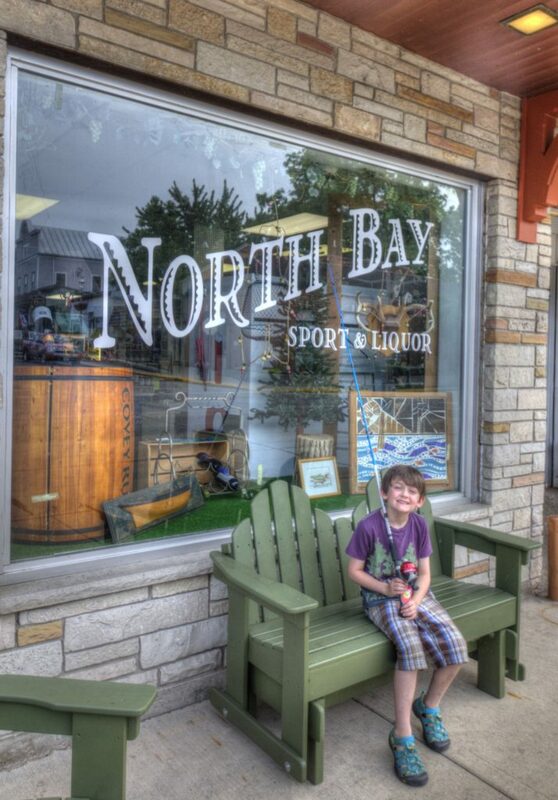 North Bay Sport & Liquor is the place to buy nightcrawlers, minnows, and a surprisingly good variety of excellent wines from around the world. The Evensong Spa is one of the country’s most lauded retreats. The rooms are serene, spacious, and flow into each other, dressed in soothing earthtones and celebrating the variations present in the natural textures of wood, rock, and gently undulating glass. Those glass walls offer views of open fields full of prairie grasses and flowers. You are encouraged to contemplate those natural expressions of color and texture in the spa’s Labyrinth, a series of concentric circles made of white pebbles that radiate outward from the center of the room’s granite floor flanked by a garden of white rock and green stands of bamboo. Circular skylights of differing sizes paint glowing pools of sunshine on the stone, creating a play of light and shadow on the narrow, circuitous path. As directed, I start by standing at the center of the labyrinth, and then proceed to slowly follow the meandering path of smooth stones. As your standard-issue, type-A personality, I’m initially impatient with the non-linear nature of the exercise, but that only serves to prove to me how much I need to let go of my usual results-oriented thinking. So I decide to just give myself over to it. I walk slowly on the narrow path, following the twists and turns around, and back and forth. And gradually my mind quiets. And clears. I find myself starting to enjoy the simple, compact journey the labyrinth offers. 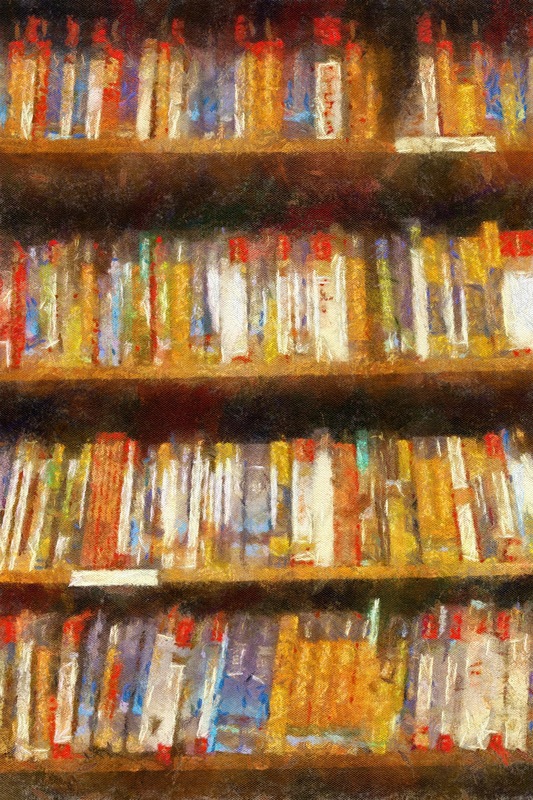 Like counting the rosary, the ritual of the labyrinth is a form of self-hypnosis; the repetition of my steps lulling me into a deep, meditative calm. I feel like a water droplet chasing its own surrounding ripples in slow motion. Having relaxed my mind, I’m ready to enjoy relaxing my body. 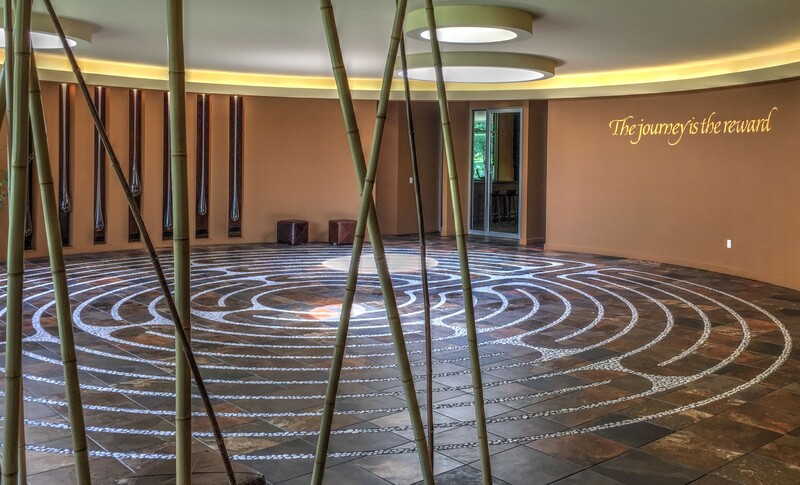 The Labyrinth at Evensong Spa. At the appointed hour, my masseuse greets me and directs me to the dressing and shower area wrapped in dark slabs of stone, with a deep, bubbling jacuzzi pool looking out on a floor-to-ceiling windowed view of the wild woods beyond. I sit for awhile in the clouds of steam and nurse a glass of iced lemon water. Time passes. I know I need to get to my massage, but I also can’t bring myself to leave the jacuzzi. What to do? This is the kind of first-world problem that I really need to have more of in my life. My masseuse is talented, and very intuitive, sussing out points of tension that I wasn’t even aware that I had until she released them. I emerge from my treatment an hour later, wrapped in a huge fluffy towel, like someone waking up from a pleasant dream, profoundly relaxed, and stupidly happy. I meet up with my wife and son for a quick lunch at the resort’s Boathouse Pub. Offering casual dining by the lake, Boathouse Pub features a cobbled patio with a fire pit overlooking a long rambling green lawn that leads down to the water’s edge. The pub is also a wonderful place to sit of an evening with a drink, and listen to the birds calling out in the wooded canopy of the surrounding trees. After lunch, we wander over to the adorable Pump House Ice Cream Parlor. It’s so small that you have to go outside to change your mind but that’s part of its charm and, besides, you’ll enjoy your frozen treat even more if you eat it while strolling along the lake. 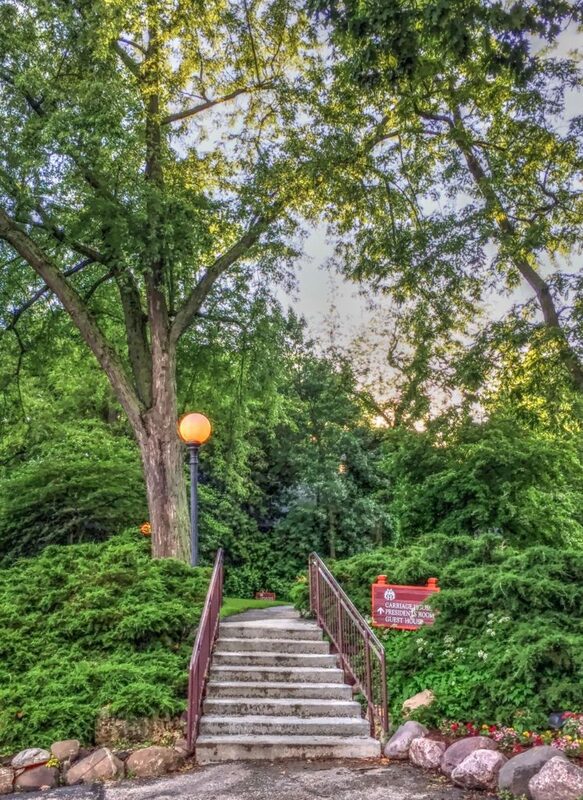 Formerly the summer retreat of members of Chicago’s wealthy Swift family (of meat packing fame), the mansion that houses Grey Rock is now an extension of Heidel House Resort & Spa, only a short stroll away along the green path that skirts the edge of the lake. The Mid-Century brick manse features many original elements, contributing to the feeling of being a welcome guest dining at the home of a friend. The menu finds a engaging balance between foodie delights and a just-folks lack of pretension. We enjoy the blackened bison won tons, the panko-encrusted walleye, and especially the delicious seared duck breast with a Wisconsin root beer glaze. For desert, we choose the seasonal fruit cocktail laced with flavored moonshine and topped with an oatmeal crisp. We eat very well indeed. Fresh from my little lesson in learning to let go at the Evensong Spa that afternoon, I fight my usual urge to jump up from the table at the conclusion to the meal, and let myself be where I am. After all, what better place could I be than on vacation, sitting with my wife and child on the shores of Green Lake? So we sit at our table before the glass walls of Grey Rock, and watch the play of light as the sun slowly dissolves into the wind-blown waters of the lake. As night falls, with the glowing trail of park lamp posts to guide us, we make our way back to our room for the night. My son, who had to ride home on my shoulders the last part of the way back, is asleep instantly. My wife, always a better sleeper than I, is out like a light soon after. A cool breeze blows over the lake. It passes through the green filter of the towering trees and rushes through our open balcony door to wash over us as we lie in our cozy beds. Closing my eyes, I think again of the labyrinth circle and, in my mind’s eye, follow the smooth stones on their meandering journey. Not hurrying. Not chasing the path to the end as I often do. But instead giving myself permission to enjoy the act of passage. This time on my way to sleep. And to dreams.